Vattenvatten!vacker utsikt över vattnet och djupt vatten segelbåt eller fiske (hamn och båtlift ingår) Tillgång till golf eller fisk för snook från din 2 sovrum stuga, nya golv, helt ny inredning, nya fönster och dörrar. 15 minuter från Bocca Grande stränder, butiker och sitta på bakgården bänk swing under stort träd läser din favorit bok i lugn och ro, titta på fåglar och fisk eller hoppa i poolen! Poolen delas med ett annat hus, tvättmaskin och torktumlare, komplett kök med kokkärl och dig tensils, få din resväska, fiskespolar eller båt, mat och koppla av och ha det roligt. The house was everything that I could want. Phil and his family were very nice. I could not have aske for anything better. Thanks for a wonderful stay. Spent three weeks in this hidden hideaway. Quiet and off the beaten path, but close enough to shopping, dining and beaches (although a little chilly for us to partake in the beach)! Owners right on property if you need anything, but not the bit intrusive and give you the most utmost privacy. 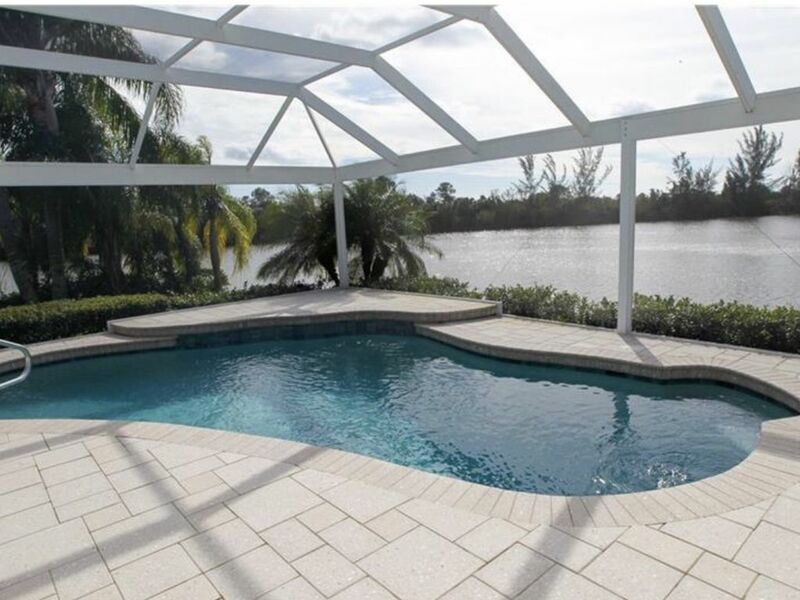 Right on the canal so you can sit in the lanai and take it the views. We were lucky to find this cottage, only wish we could have stayed a little longer! It’s like a Home Away from Home! We have traveled the world renting many different homes and condos. This South Gulf Cove cottage makes the top of the list! It was super-clean and filled with everything you would ever need/want while renting a home away from home. The waterfront canal setting is peaceful and located in a very quiet area. Excellent restaurants and grocery stores are a short car drive away. You won't go wrong with this beautiful rental. The owners live next door and will invite you to swim in their back patio swimming pool. My wife had to call me over and check the cottage out after you all left, we were both amazed how spotless the place was after you left.So sorry you had to go.Wish you guy"s the best in your retirement travels. very nice , everything you could think of was provided. the only thing is the pool is shared with owner , and this is disclosed in ad. not a big deal to me , but maybe to you. the view was great. very private. It was of great pleasure to have You and your family as our guests.Hope to see you all again in your travels back to Florida. Thanks again !! OMG. A very lovely cottage with all the amenities for either a short or extended stay. Nicely decorated and very clean. Beautiful and serene surroundings. Although secluded from the heavy traffic areas (which we liked) its location is only a short distance to the beaches, kayaking, restaurants and shopping, etc. And Fishing is right out the back door! Wanted to book this place in January and February, but someone beat us to the punch. Highly recommend if looking for a quite peaceful retreat. It was a real pleasure having you stay with us.We had no idea you were even here and when you left ,the house was spotless.I wish you all the best and good luck with your new home building in West Coast of Florida,it”s a great State to live or have a vacation.